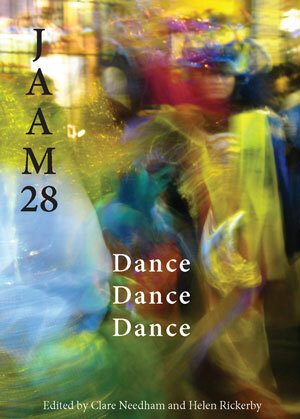 The latest issue of JAAM has been out for a few weeks. JAAM is a literary journal containing poetry and prose and varying amounts of non-fiction essays, photos, illustration, interviews… This time it also contains something by me. So naturally, a blog post telling you to buy it. That’s how these things work. JAAM has been published out of Wellington since ’95, when it launched at the same time as a Victoria University Writing Club – the product of Mark Pirie’s enthusiasm and drive. The club lasted a few years before dissolving into a loose network of friends, but JAAM has published regularly since ’95. Currently an annual publication, edited by Helen Rickerby and Clare Needham (who were both in that original Class of ’95), this issue has the theme of “dance”. I’m pleased to have a story in there because I really have a lot of love for JAAM, and its relaxed and unaffected sense of style. Also because, as mentioned in my author bio in the issue, I was there in ’95 when the club began and the journal was announced. It took me a very long time to submit something. Anyway, even though I talk about me in this post, I’m only a few pages of a wide-ranging and nimble collection. The Xmas gift idea suggestion is a genuine one. This is good stuff, to be enjoyed. JAAM is (or soon will be?) available at Unity Books in Wgtn and other places like that. Posted by morgue on Monday, December 6, 2010, at 12:25 am. Filed under Self-ish, Writing. Tagged self-promotion, Writing. Follow any responses to this post with its comments RSS feed. Both comments and trackbacks are currently closed. Congrats Morgue. What story did ye get published? And a damn good story it is too! Thanks for the plug. JAAM is indeed available at Unity Books in Welly, and also in Auckland, and various other awesome independent bookshops.